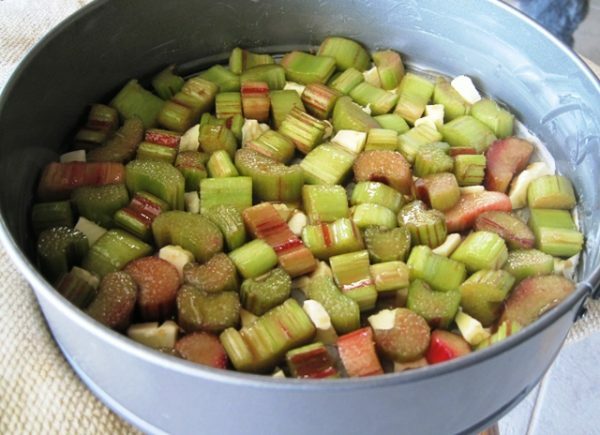 Cooking with rhubarb brings back sweet memories of my childhood. My mom always grew rhubarb in her veggie garden, and used it in cooking and baking. She would use it as a filling for varenyky (perogy), steamed dumplings, added it alongside other fruits to her uzvar (kompot), a little bit went a long way in her Strawberry Soup , as well as a filling for cakes. Today’s recipe is for an Upside-Down Rhubarb Cake, which is absolutely delicious, and I am sure you will agree, once you enjoy a piece. 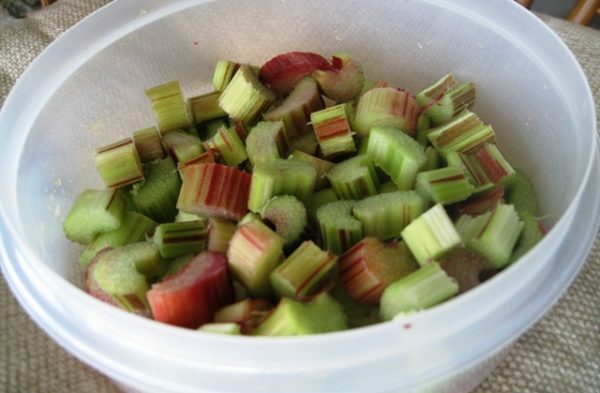 Rhubarb stalks, trimmed, peeled and cut to 1 inch pieces, crosswise. Crumb topping made out of butter, sugar and flour, mixed with a fork. Butter chunks spread all over the parchment lined pan bottom. Rhubarb/sugar mixture over the butter chunks, and pressed down firmly, to form the bottom for the cake. 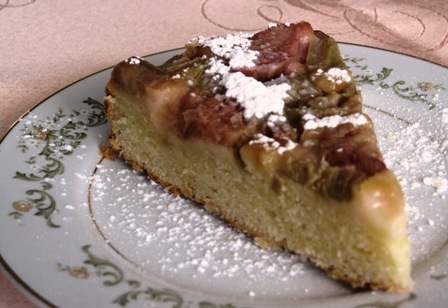 The batter is spooned onto the rhubarb, and pressed down gently all over the filling. 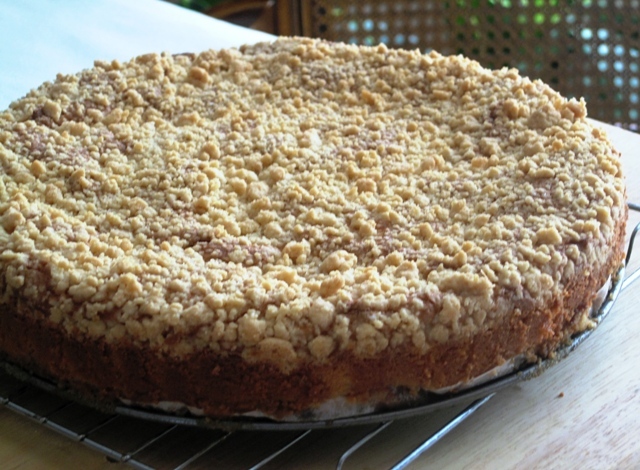 The crumb topping is sprinkled all over the top of the batter. The baked cake, still on the springform bottom, is placed onto a wire rack to cool for at least 20 minutes. Trim both ends of the rhubarb stalks. Peel the stalks, and cut up into 1 inch pieces, crosswise. Add brown sugar, toss gently. Mix the rhubarb with sugar once again, before using it in the cake (the juice from the rhubarb will slightly melt the sugar by now). In a medium bowl, add the softened butter, sugar, salt and flour. 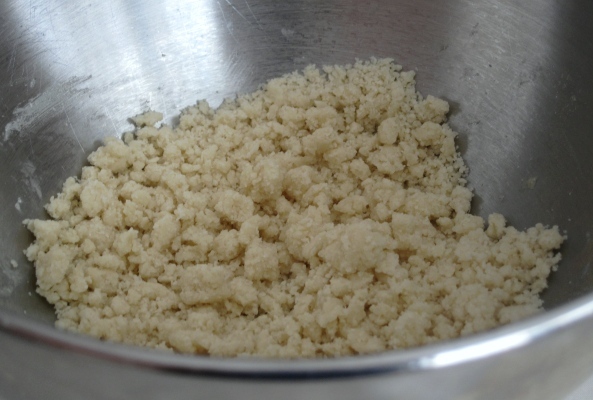 Using a fork, mix it all together, to create crumb mixture. In a medium mixer bowl, add 1/2 cup of butter (room temperature), and 1 cup of sugar. Mix well, until a light and fluffy (about 15 minutes ), scraping sides frequently, for even mixing. Add lemon zest, orange juice, and vanilla extract. Add one egg at a time, and mix well, after each addition. 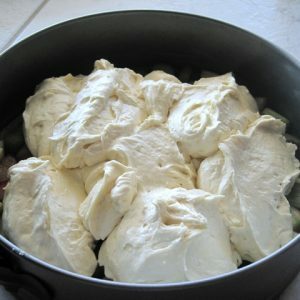 Mix in 1/2 of the sour cream. Mix in 1/2 of the flour, into the butter mixture. 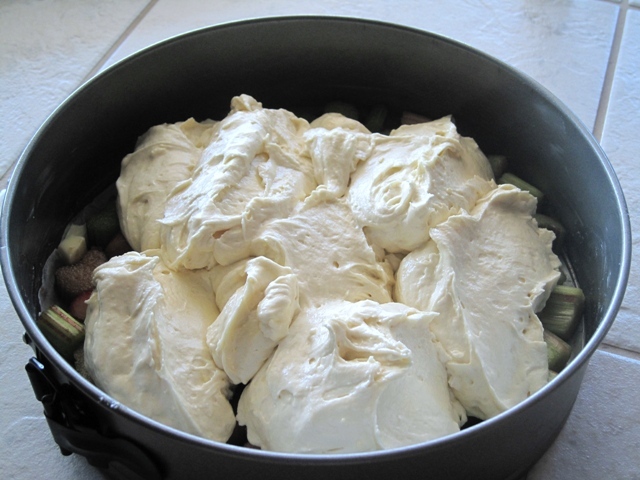 Add the rest of the sour cream, mix gently, then add the rest of the flour. 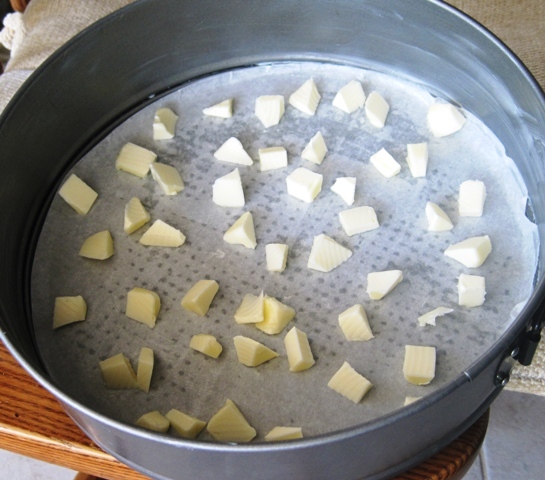 Use parchment paper, trace the bottom of a springform baking pan onto it, and cut out the circle. Grease the sides of the pan, and dab few spots of the bottom. Place the parchment circle on the bottom of the pan. Use the 4Tbs. of refrigerated butter, set aside previously, cut it up into small chunks. Drop butter chunks all over the parchment lined pan bottom. Spoon the rhubarb/sugar mixture over the butter chunks, and press down firmly with a back of a spoon, to form the bottom for the cake. 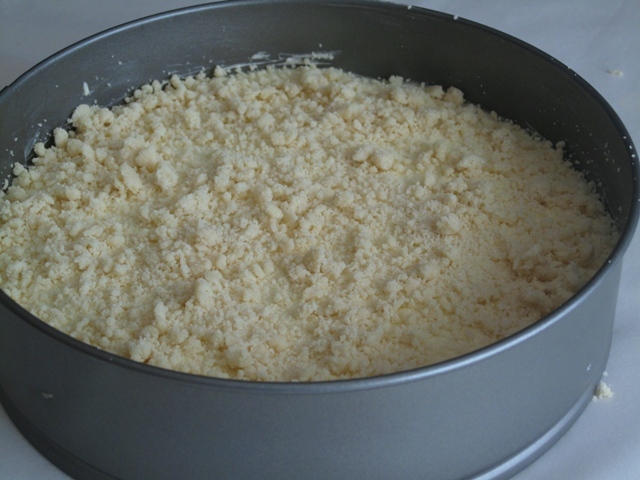 Sprinkle the Crumb Topping all over the top of the batter. Place the springform pan on a large piece of aluminum foil, roll up all the edges to form a rectangular pan (this will prevent messing up your oven, by the rhubarb juices dripping out of the pan during baking). Place the cake pan with the foil lining, on the middle oven rack. The topping will be lightly browned. 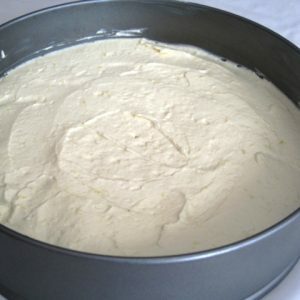 Remove the cake from the oven, and cool in the pan for 5 minutes. Use a knife to separate the cake from the sides of the springform. Remove the sides of the springform. Set the cake, still on the springform bottom, onto a wire rack, to cool for at least 20 minutes. Invert it onto a cake stand (with the crumbs at the bottom). Gently peel off the parchment paper from the top of the cake (this used to be the bottom of the cake), and let it cool completely. Sprinkle with powdered sugar before serving, or serve it with a dollop of whipped cream. I wrapped a piece of this cake in aluminum foil, and froze it for 30 days. After thawing it at room temperature for about 1 hour, the cake was AWESOME!! It tasted as if I just baked it. Yum, that cake is pretty delicious! 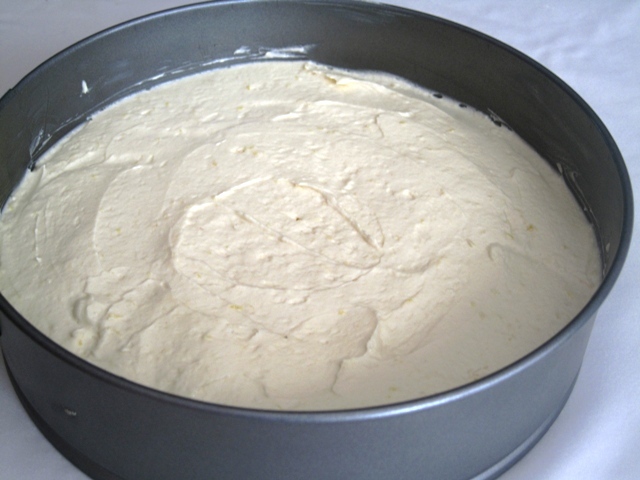 My second try of this recipe was much better….the cake part was fluffier. You should try zapping a cold piece of this cake in the microwave for 10 sec….oooohhhh….like fresh out of the oven!!! 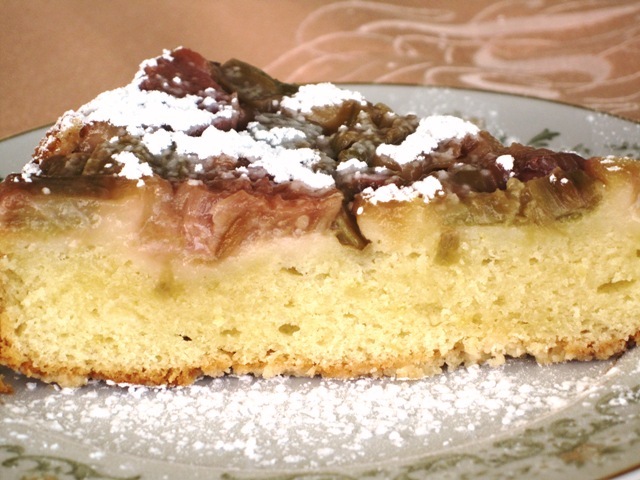 If you like rhubarb, you will love this cake. As simple as it is to make, it takes wonderfully delicious. Please remember to cover your lower level rack of the oven with foil, to prevent a “royal mess” from the dripping fruit juices,from the springform pan, during baking. Made the cake yesterday and it was a hit…DELICIOUS! Thanks for the recipe and the foil tips. My oven would have been a great disaster otherwise. The only thing I did different was for the rhubarb part I added strawberries and blueberries to it, because I didn’t buy enough stalks of rhubarb. Still delicious and would definitely make it again. Congratulations on your baking success!! I bet your fruit combination not only made the cake delicious, but also made it very special, and yummy. I made this cake with apple slices and golden raisins, and loved it as well. Yes, the foil liner below the baking pan does save a lot of oven cleaning time. Thank you for sharing such lovely comments. 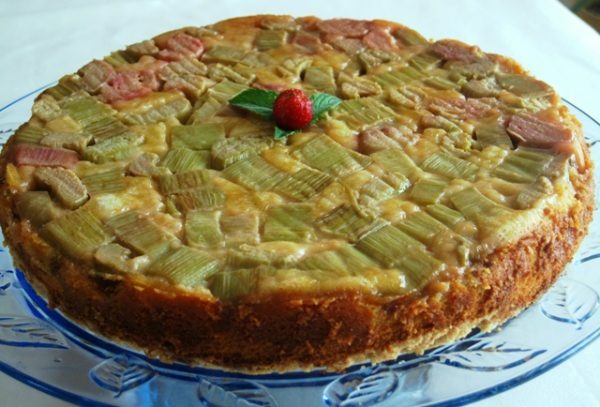 you are most welcome….rhubarb varenyky are awesome….but need lots of sweetening….